Drilling got underway this week for the KWS maize trial on row width manipulation. The standard row width of 75cms is being sown at KWS HQ in Gloucestershire alongside a crop with 50cms row spacings, using the very high-yielding KWS energy variety, Amaroc. 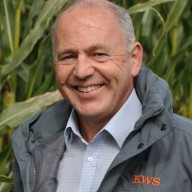 John Burgess of KWS developed the trial because growers have traditionally travelled diagonally across the fields, to allow for tramlines, and accepted a minor level of plant damage. Hopefully, the 50cms row spacings should solve the problem. John is not expecting any major difference in yield between the two plots, because the crop at 50cms should close up the rows, due to increased access to sunlight. Seed rates of 110,000, 95,000 and 85,000 seeds/hectare have been used, to provide additional comparisons. Keep an eye on this page for updates and photos of how the two crops perform over the season, as well as yield figures after harvest.